Network management tools are essential in networks that demand constant monitoring in parameters such as, confidentiality, performance, error analysis, security, traffic characterization, QoS, network planning and traffic predictions in order to assure top service quality. Telcomanager provides a management system based on appliances. Our appliances based solution is customizable to different network complexity and size. For each Network configuration we have different setups that assure the correct processing and data storage for your configuration, assuring also that there are no traffic leaks or slowness in the management system. 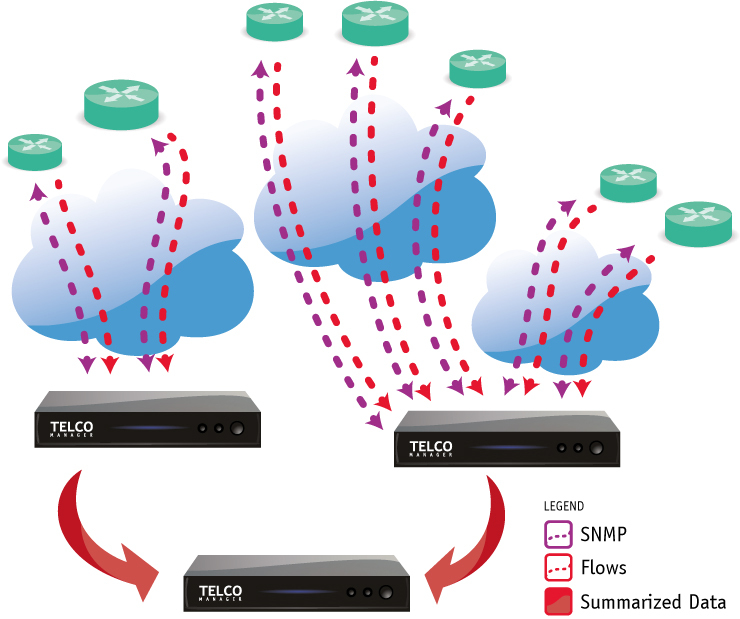 Figure 1: Illustration on SNMP and Flow (e.g. NetFlow, JFlow, SFlow and Netstream) traffic requisition. In highly populated networks, where the large number of elements create large amounts of data flow a distributed architecture is implemented. It is a management system that takes use of devices called Collectors and Consolidators that collaborate between themselves in order to ensure the best performance in data collection, allowing you to have an agile and efficient way to monitor the entire network without any major information loss. The Collectors aren’t simply information repeaters. They are appliances that are connected in a cluster that collect and process raw data in order to provide the operator the data analysis that he requires. After this raw data processing each collector sends the processed data to a consolidator. The consolidator is an appliance that concatenates all received data from each collector and delivers it in a readable way, to the operator, through the SLAview and TRAFip tools. In a nutshell; with these appliances the operator have a distributed monitoring set up but at the same time have all data concentrated in a device. This way, all the important network management data can be found in a single device making a lot easier to operate a large scale network. Each collector registers all information about SNMP requisitions and data flow for a selected part of the network. However, the system distributed architecture guarantee a redundancy between the collectors allowing the commute of monitoring tasks to other collector. This way, the management system introduces context switch functionality between the appliances and redundancy in the consolidator, guarantying permanent network monitoring. At this moment there are networks operating with more than 10000 elements being monitored by a platform with less than 10 appliances, including redundancy. Figure 2: Distributed Architecture traffic management example. In a distributed system, you have total control and supervision of your collectors. Through the TRAFip and SLAview tools you can check the main information of your collectors, such as, IP address and operating state. Figure 3: Consolidated view on 8 collectors’ main information. In a Distributed Architecture system some specific parameters can be fully configurable through SLAview and TRAFip tools. 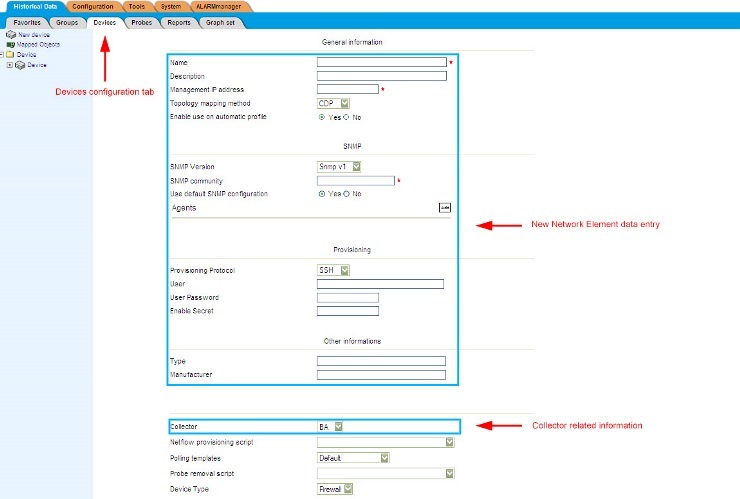 By example, when you map a new network device, through your Administration tool, in your network you have to add it logically to the collector where this new element is physically connected. This way you have total freedom to define and organize the Collectors Set in your network and which network elements are logically connected to each collector giving you much more freedom and flexibility when creating new network topologies together with the management devices. Figure 4: Consolidator view of the Network Element registration table. Collector related information is only displayed when Distributed Architecture is enabled. In failure cases, for instance, when the power in the Collector is out, the Administrator has a proactive help from the tool. The system will pair up another collector with the one that is not responding to the Consolidator requests. The tool has all the information required to redirect all information flow and requests to the paired collector in case of a down status of the original collector. This will guarantee that your network is still fully monitored. Also, from the Consolidator you can generate a provisioning script that allows you to redefine the destination IPs, to a paired collector, in the devices that route data flows like NetFlow. This way, no data loss will occur in the monitored area. Figure 5: Maximum number of consecutive fails before collectors pairing. When asked, a collector can reply to the consolidator each 5 minutes. 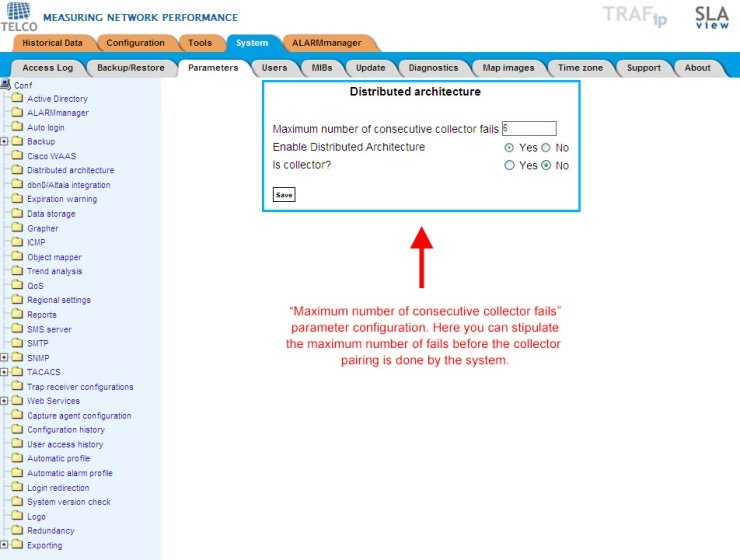 In this example after six failures (which represents 30 minutes) all data collected by the failing collector will be redirected to a paired collector. next post: Reports? Piece of cake!